Summer in Finland means ice cream and I am sorry to report that we have a Situation right now. Our local Prisma (and the one across town! Not that we went there to check, or anything...) is just plain OUT of the best kind of ice cream cones. Ice cream in Finland is not as good as in the US (the good stuff here is like store-brand level US ice cream), but it is still delicious, because it is ice cream. This summer, we developed a taste for Rainbow brand toffee ice cream cones. 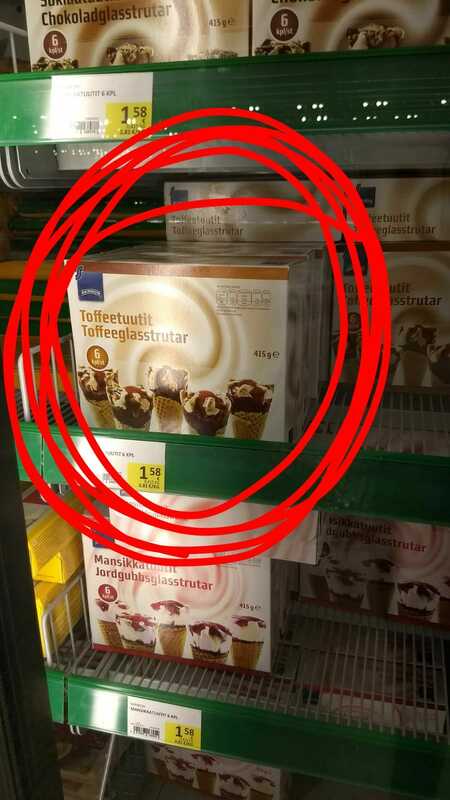 They were so tasty, and a steal at €1.58 for six cones! In late June, our local Prisma ran out of these toffee ice cream cones. They put up a sign saying there was a temporary disruption in the supply chain, and they stayed out of stock for weeks. The weird thing was that when Jeremy and I went to Åland - literally a group of islands in the middle of the sea - THEIR Prisma had them in stock! If only we could have brought them home with us. Last week, they were in stock again, briefly. I sent a gloating text to Jeremy (he was out of town in Lapland doing an ultra). But now they're gone again. In fact, the entire ice cream section is looking a bit decimated. I brought home Jaffa and strawberry cones today - not a box of chocolate ice cream cones to be found! (Except a partially opened one, which, no.) Let's hope this supply chain issue sorts itself out before summer comes to an end!